The significance of the Bible in the war, and anti-war efforts, of both Allied and Central powers in the First World War are to be examined in a new research project, which will document ways in which scripture was used to create notions of a Holy War, and how views of the Bible changed as a result of the conflict. Amid the mud and mechanised slaughter, it is difficult to see how the teachings of the Good Book could have been much more than an afterthought for those who lived and fought through the horrors of the First World War. Yet as a new research project aims to reveal, the Bible may have done far more to shape popular perception of the war than has previously been appreciated. Starting this week, researchers at the University of Cambridge will embark on a centenary study examining how the Bible played an influential role in the deadliest armed struggle that the world had, at that stage, ever seen. Over the next two years, an international network of academics in various disciplines including history, literature and theology will attempt to piece together an aspect of the conflict that remains broadly overlooked, showing how the supposed word of God was widely employed both to support and oppose war efforts on both sides. Among other themes, the research will explore the Bible’s role as inspiration for soldiers, a device for swaying public opinion, a foundation for conscientious objection, and as a text so important that German theologians debated whether the Bible was sufficiently bloodthirsty to be given out to the troops. Entitled “The Book And The Sword: The Bible in the Experience and Legacy of the Great War”, the project will consist of three workshops being held in Cambridge and Ludwig Maximilian University of Munich as well as events engaging the public and church leaders with various partner organizations including St Paul’s Cathedral and Westcott House, an Anglican Theological College affiliated to the University of Cambridge. The project is being carried out in the University’s Faculty of Divinity by Andrew Mein, a senior researcher at Westcott House and Nathan MacDonald, an Old Testament lecturer at the University and a Fellow of St John's College. Researchers argue that the Bible represents something of a “blind spot” in academic and popular understanding of the Great War, its legacy, and in particular of the terms in which the war would have been seen at the time. Religious instruction was still a core part of the education of many of those who fought, and soldiers and civilians alike were still widely familiar with scripture. In Britain, Bible Society printing presses went into overdrive in 1914 as efforts were made to satisfy the demand for personal copies among troops departing for the front. Dr Nathan MacDonald, the project’s co-lead, said: “It is difficult to remember just how suffused the culture of the Edwardian Era was in the language of the Bible. The Bible was hidden in plain sight. If you left school at 12 or 14 you probably knew the Bible better than many theology students now. Many people could quote it with ease. The religious resonance with which aspects of the war were fought is perhaps most obvious in the Sinai and Palestine campaign, in which the British ultimately defeated a German-supported Ottoman army. The researchers argue that for the Christian nations involved, this was seen as a battle for their own people’s hearts and minds, with both sides keen to present success in the Holy Land as symbolic of a righteous cause. Germany, for example, sent a battalion to the Middle East charged with protecting monuments and claiming inheritance to the world described in the Bible, including in its number the theologian Albrecht Alt. When, in December 1917 General Edmund Allenby became the first Christian to capture Jerusalem for centuries, he deliberately entered the Old City on foot, taking his cue from the description of Jesus’ humility in the Bible. The Prime Minister, David Lloyd George described the victory as “a Christmas present for the British people”. More broadly, the Bible was an essential tool of the propaganda war. British publications depicted the Germans as “Philistines” and as a modern-day Assyria sweeping down on Israel. The Bishop of London, Arthur Winnington-Ingram, whose jingoism periodically offended leaders on even his own side, proclaimed a “great crusade to defend the weak against the strong”. Motivational sermons by the Archbishop of Canterbury, Dean of Westminster, and other religious leaders, were printed in national newspapers. The use of the Bible is particularly evident in the German context, however, where a debate erupted over whether soldiers should be allowed access to it at all. Some academics feared that, with its peace-loving message, the text would weaken soldiers’ will, but their opinions were successfully countered by a school of thought which argued that the Bible persuasively encouraged violence for a cause. As this implies, one of the project’s main contentions is that the Bible was used on both sides as a “mirror” in which any claim (or counter-claim) could be seen reflected. Many conscientious objectors, for example, refused to fight on religious grounds, and often found themselves before tribunals at which they were grilled on their Biblical knowledge by Church officials. The project will also examine how the First World War changed the way in which people treated the Bible. For some, the conflict destroyed any belief in God; but for others it represented the apocalypse as foretold. During the war interest in the Book of Revelation and its apocalyptic prophecies soared. Opinion also evolved within the Church. The German-based scholar, Alfred Bertholet, argued that war had enabled Biblical concepts such as divine vengeance to be appreciated with deeper resonance by those who had survived. Meanwhile, Karl Barth, deploring the way his teachers in Berlin had used the Bible to support the war effort released a revised commentary on the Book of Romans, which laid the foundations for what became known as “neo-orthodoxy”, and for much 20th Century Christian thought. “The Book And The Sword” is funded by the Arts and Humanities Research Council. 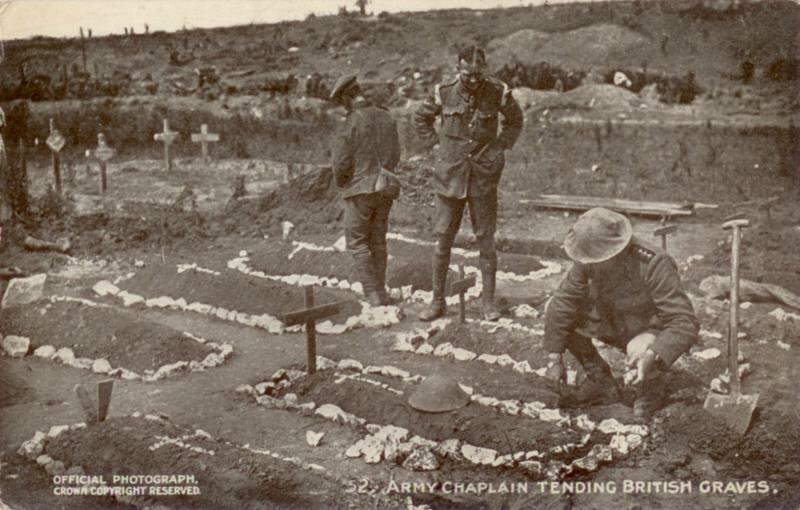 Additional image: Army Chaplain tending British graves, from a Daily Mail Official War Photograph, reproduced via Wikimedia Commons. General Sir Edmund Allenby enters Jerusalem in December 1917. The widely-circulated image of him entering the Old City on foot conjured up images of Christ-like humility in the Bible in a calculated attempt to win over hearts and minds.